In the period from 1900 to 1940, there was a tremendous growth in industry in the United States. Marine engine builders were opening up shop in large cities and small towns across the country. Some produced thousands of engines and shipped their products around the world while others supplied commercial and recreational customers in their local region, producing a limited amount of engines. We will publish company histories as well as advertising literature and catalogs to offer useful information to anyone researching a particular engine or builder. We will attempt to indicate the source and date of the information provided. Some of the initial information to be posted will include Acadia, Buffalo, Buda, Cady, Dunn, Eagle, Fox, Frisbie, Gray, Hicks, Lathrop, Lozier, Mianus, Midland, McDuff, Palmer, Red Wing Motor Co., Regal Marine Engines, Roberts, Standard, Truscott, Termaat & Monahan, Tuttle, Union Gas Engine Co. CT Wright. 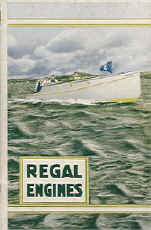 If you have original information that you have researched and written, or period articles or advertisements for pre-1940 marine engine builders that you would like to submit, please contact us by e-mail.